March 20th was la Journée Internationale de la Francophonie (Francophonia Day) and I had this to say on Global Voices for the occasion. Please please please check out Global Voices en Français and tell your interested friends when you get a chance. (Lire le billet en Français à ... Global Voices en Français, traduit par Claire Ulrich.) And please contact me in the comment section to volunteer if you are a French-English bilingual. At Global Voices, this day has special significance as well. One year ago, I was barely getting my feet wet as a novice Francophonia Editor, translating into English blurbs from the blogs of French-speaking countries who don't get much coverage in other media. Today as Global Voices Lingua team leader, I and wonderful francophones like India-based Haitian blogger Pascale Doresca, French journalist and Le Monde contributor Claire Ulrich and Malagasy blogger and GV author Lova Rakotomalala have been translating in the other direction, i.e. from English to French at Global Voices en Français. The goal is to bring more and more Francophones online into the global conversation. By translating Global Voices content into French, we hope to do just that. See for yourself, the Global Voices en Français site is a work in progress but volunteer translators have been generating French-speaking GV content for Francophones for over a month. If you are a French-English bilingual, please contact us to join the team at francophonia [at] globalvoicesonline [dot] org. Flashback. 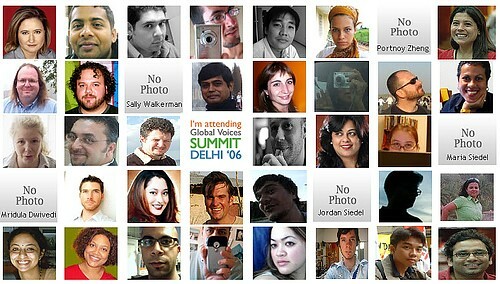 Inspired by Global Voices Latin-America Editor David Sasaki's workshop on GV and language at the GV 2006 Summit in Delhi, a group of francophone bloggers approached Global Voices co-founders Ethan Zuckerman, Rebecca MacKinnon and Portnoy Zheng about starting a Francophone GV page similar to Portnoy's then year old GVO China site over lunch at Delhi Day 2. Other language communities expressed interest and Project Lingua was born. Please join me and the whole Lingua team by contributing your language skills to any of the above groups. Francophonia Day is truly a multilingual day for us at Global Voices.